For the last 50 years, Ken DeCamp has been capturing images of wildflowers from around the world. But a personal passion for one California mountain range has captivated him more than any other. His father was a dam builder, working on projects all over the Pacific Northwest and eventually Pakistan and Australia. It was in the late 1950s when they moved to Lewiston, California to work on Trinity Dam. Being lifelong wilderness enthusiasts it was here his family fell in love with the Trinity Alps. Ken has spent 60+ years exploring the Klamath Mountains but is particularly fond of the Trinity Alps and the Russian Wilderness where he developed a deep love for these wild places. In fact, he loved the area so much that he never left. He retired from the Shasta-Trinity National Forest in 2007 after a 38 year career in Fire, Land Management Planning, and Public Affairs. He still lives in Shasta County. Monterey County is one of the most bio-diverse regions in the nation and is home to the world’s oldest and largest wildflower show in the Northern hemisphere. This year’s show, which the CNPS Monterey Chapter organized and hosted from April 14-16 at the Pacific Grove Natural History Museum, featured 722 plant specimens! The story of the Mount Diablo buckwheat actually starts out as a geology story with the creation of our state’s first Geological Survey of California. In the wake of the Gold Rush, the state legislature passed an 1860 act establishing the Survey and the Office of the State Geologist. The act assigned Josiah D. Whitney (for whom Mount Whitney is named) to fill the new office, and Whitney quickly assembled a team that included William H. Brewer as chief botanist and field party leader. This article, first published in the January/February 2011 issue of The American Gardener, is reprinted with permission of the American Horticultural Society. Since leaving Michigan almost 30 years ago, I have made the acquaintance of many fine California native plants. My list of favorites keeps changing but Cleveland’s shooting star (Dodecatheon clevelandii, now called Primula clevelandii) is always among them. 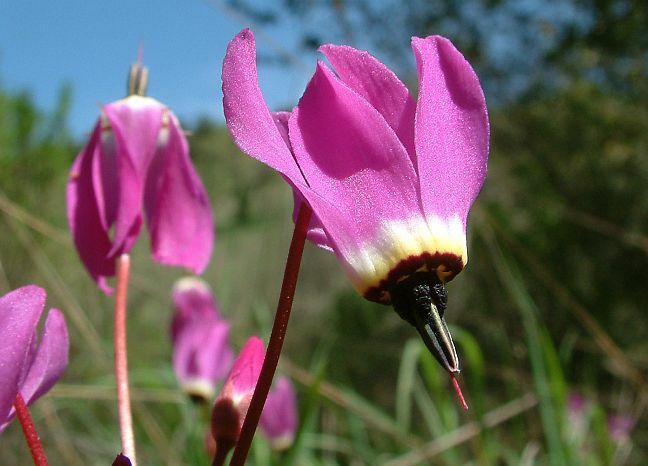 California is home to eight of the dozen or so species in the genus Dodecatheon, which is predominantly native to western North America. The lone representative of the eastern United States is eastern shooting star (D. meadia). The genus possesses a list of evocative common names: American cowslip, rooster combs, bird-bills, mosquito-bills, mad violets, sailor caps, prairie pointers, and wild cyclamen. The last is particularly apt, because cyclamen are the Asian and European relatives of Dodecatheon. In California, shooting stars comprise two basic categories: high-elevation species that bloom in the late spring or summer and occur in moist habitats, and lowland species that bloom in late winter or spring and grow in the winter-wet, summer-dry Mediterranean climate regions of the state. They share easily recognizable flowers, whose slightly askew, reflexed petals are indeed reminiscent of cyclamen. Borne in loose umbels, the nodding white to magenta flowers seem to dance atop leafless stalks, stealing the show from the rather plain basal foliage. Cleveland’s shooting star (D. clevelandii, USDA Zones 6-9, AHS Zones 9-5) is one of the most appealing members of the genus. Found throughout much of California’s Mediterranean core, this clove-scented perennial grows wild on grassy slopes and flaps in chaparral, foothill woodland, and valley grassland communities from central California south into Baja California, Mexico. The most commonly cultivated form, D. clevelandii ssp. 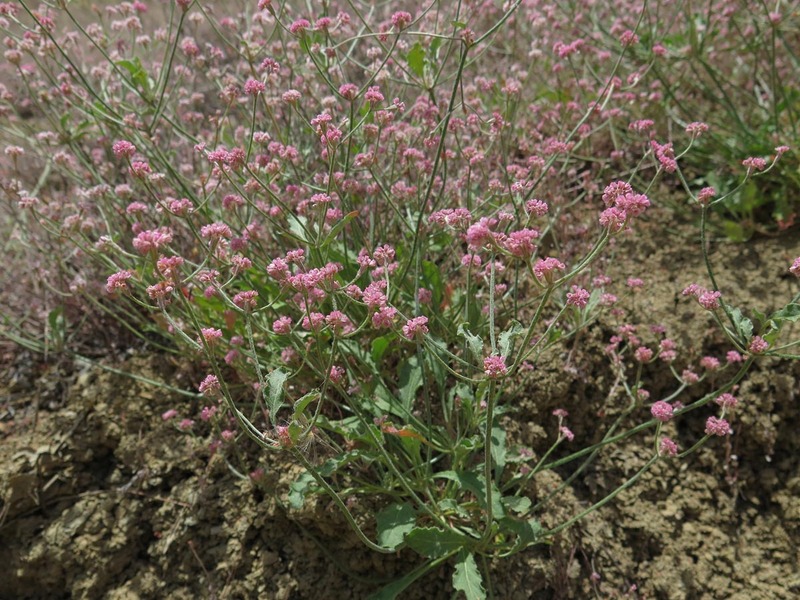 insulare, is found in southern California and the offshore Channel Islands. Emerging in fall, shortly after the rainy season begins, the plant’s light green, somewhat succulent leaves signal the end of its summer dormancy period. Soon thereafter, the flower stalk elongates, reaching eight to 16 inches tall. Once the buds open, the upswept petals of lilac, rose, magenta, or white appear poised for flight. Later, the ripening seeds within the tan seed capsules rattle in the slightest breeze. Although widespread in nature, Cleveland’s shooting star isn’t as easy to find in commerce. Yet gardeners who successfully track down seeds or plants will be amply rewarded if they follow a few simple guidelines. Place them in a sunny or partly shaded location and keep them well watered from autumn through spring. Then allow them to dry out completely in summer, otherwise their delicate, fleshy roots will rot. The succulent leaves and roots attract snails, slugs, and gophers, so protect the plants from these pests. Seeds germinate fairly easily and plants reach flowering size in about three years. There are many ways to appreciate shooting stars in the garden. Growing them in containers is the most reliable method, whether nestled into established plantings while in flower and whisked away as the foliage yellows, or combined with other compatible plants in a trough garden. Rock gardeners can tuck a few among bulbs, succulents, and other diminutive companions. For a captivating effect, plant drifts in a grassy meadow or beneath the dappled shade of trees or tall shrubs such as redbuds or manzanitas (Arctostaphylos ssp.). Be sure to retain the showy, dried inflorescences long enough to release the next generation of shooting star seeds. Carol Bornstein is Director of the Nature Gardens at the Natural History Museum of Los Angeles County. She co-authored California Native Plants for the Garden and Reimagining the California Lawn. For 28 years, she was a horticulturist at the Santa Barbara Botanic Garden. 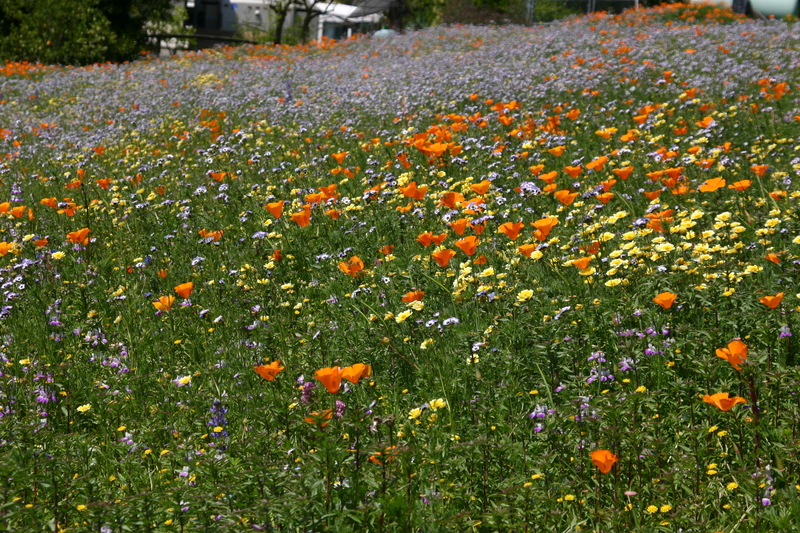 A small portion of a 1.5 acre wildflower meadow created by the author in Fallbrook in 2011. Flowers include Tidy Tips, California poppies, Desert bluebells, Owl’s clover, and Chinese houses. Photo by Greg Rubin. Few things evoke magical memories like spring wildflowers. Whether it is a desire to recapture a serendipitous discovery of a color-laden flower field from our past, or simply re-living that scene from the “Wizard of Oz”, nothing stirs our passion for nature like a beautiful field of flowers. California was once celebrated for its annual floral shows; unfortunately, these delightful events are becoming a thing of the past. The great Kate Sessions lamented that wildflowers were disappearing from San Diego’s foothills by the early 1900s. Even her attempts to include wildflower displays at Balboa Park repeatedly failed. Why? The answer is that European settlement in California altered our delicate ecology so profoundly that it was lost at all levels. Nothing is quite so fragile as a wildflower meadow. These annuals serve as pioneers that help re-establish ecology should a disturbance wipe out climax shrubs and trees. Being so low in lignin, they disappear after dying, returning all of their nutrients back to the ecology. Additionally, they fill holes not occupied by shrubby plants, and persist in places inhospitable to anything with deep roots, such as in the shallow soils of true native grasslands. What the Europeans brought were non-native weeds: competitive plants unhindered by native bio-controls while putting all of their life energy into reproducing themselves. These non-native seed banks now reach 10-100,000 dormant seeds per cubic foot! The wildflowers never stood a chance. Seed was spread to create overlapping drifts of color, which is essential to maintain drama in such a large planting of wildflowers. Photo by Greg Rubin. Fortunately, knowledge is the best tool, and we have ways to turn back the clock. Eliminating weeds is foremost. It is usually not sufficient to clear a space and drop seed, as Ms. Sessions learned. Instead, the seed bank must be addressed, either through repeated watering and killing of emerged weeds, or the use of chemicals called pre-emergents that kill seed in the soil when watered in. This must be done months in advance of planting. Solarization with clear plastic can also be used, but the effect is usually temporary. After treatment, seeds can be spread and either gently raked in or covered lightly in decomposed granite (this avoids disturbance and deters birds). Wildflower seeds can be purchased at most garden centers and online; however, be sure that the word “NATIVE” is somewhere in the title, and that the species are native to your locale, or you will end up with a mix of weedy introduced flowers, the worst being Alyssum. (ED note: You can check the local appropriateness of your chosen seed mix ingredients by entering your address in CNPS’s Calscape app, available at calscape.org or on CNPS’s homepage.) 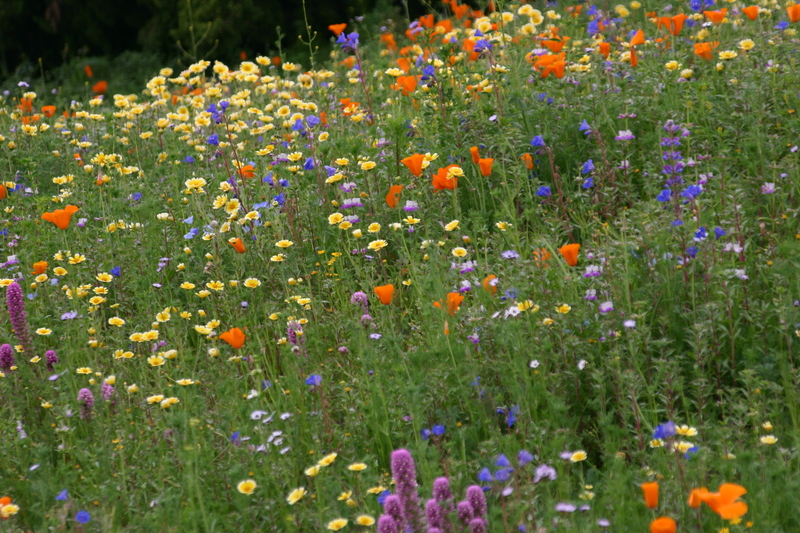 Common native mixes include California Poppies, Lupines, Goldfields, Desert Bluebells, Gilia, Baby Blue Eyes, Tidy Tips, and Farewell-to-Spring. You can add Owls Clover, Five Spot, and Thistle Sage if available. Keep the plot lightly moist until germination, continue watering twice a week if rainfall is lacking, and CONTROL WEEDS! The outcome will be thrilling! CNPS Member Greg Rubin is the founder and owner of California’s Own Landscape Design, Inc. (www.calown.com) and a popular speaker. A specialist in the use of native plants in the landscape, he is responsible for over 700 native landscapes in San Diego County and co-authored (with Lucy Warren) two books on native landscaping: The California Native Landscape: the Homeowner’s Design Guide to Restoring its Beauty and Balance and The Drought Defying California Garden: 230 Native Plants for a Lush, Low-water Landscape, both on Timber Press. Their photos are all really clear – for example, the one shown here is Dodecatheon hendersonii – I wish I could capture an image that radiant. Please pass this along to those who love clear examples of nature’s best. Debra Prinzing, of the Slow Flowers movement, wrote a very engaging article for the Los Angeles Times, which is all about native gardening’s increase in popularity. There are some nice photos, and The Theodore Payne Foundation’s Kitty Connolly is quoted as saying. 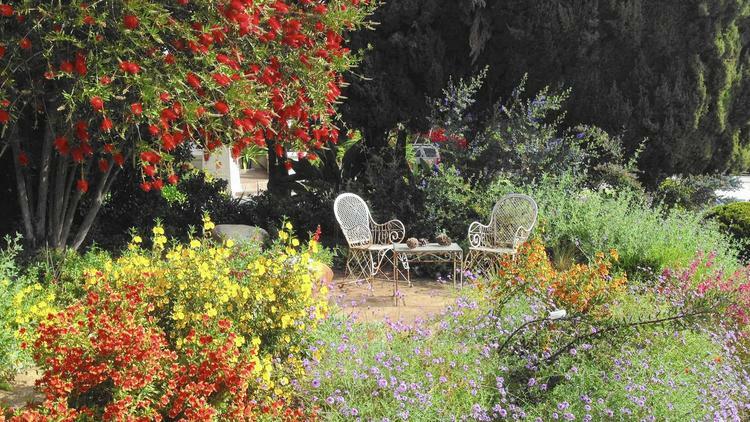 “Now is the perfect time to plant so that you will have a beautiful garden next spring.” The article highlights several Los Angeles area gardens, so do go and check it out.